The Colorado River Compact is a 1922 agreement among seven U.S. states in the basin of the Colorado River in the American Southwest governing the allocation of the water rights to the river‘s water among the parties of the interstate compact. The agreement was signed at a meeting at Bishop’s Lodge, near Santa Fe, New Mexico, by representatives of the seven states the Colorado river and its tributaries pass through on the way to Mexico. The compact divides the river basin into two areas, the Upper Division (comprising Colorado, New Mexico, Utah and Wyoming) and the Lower Division (Nevada, Arizona and California). The compact requires the Upper Basin states not to deplete the flow of the river below 7,500,000 acre feet (9.3 km3) during any period of ten consecutive years. Based on rainfall patterns observed in the years before the treaty’s signing in 1922, the amount specified in the compact was assumed to allow a roughly equal division of water between the two regions. The states within each basin were required to divide their 7,500,000-acre (30,000 km2) foot per year (289 m³/s) share allotment among themselves. The compact enabled the widespread irrigation of the Southwest, as well as the subsequent development of state and federal water works projects under the United States Bureau of Reclamation. Such projects included the Hoover Dam and Lake Powell. 0.05 million are deducted. Arizona’s percentage is of the total. In addition to this, 1,500,000-acre-foot (1.9×109 m3)/year of Colorado River water is allocated to Mexico, pursuant to the treaty relating to the use of waters of the Colorado and Tijuana rivers and of the Rio Grande, signed February 3, 1944, and its supplementary protocol signed November 14, 1944. Also, the lower basin can get an additional 1,100,000-acre-foot (1.4×109 m3)/year in surplus conditions. The compact was the fruit of several years of negotiations among the states. The seven states had previously formed the League of the Southwest in 1917 to promote development along the river. In 1921, Congress authorized the states to enter into a compact for allocation of the river resources. The agreement was approved by Congress in 1922, the same year it was signed. 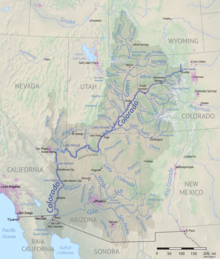 Colorado River Compact was signed by the delegates from the seven Colorado River Basin states: Wyoming, Colorado, Utah and New Mexico were designated Upper Basin states and California, Arizona and Nevada as the Lower Basin states. This compact determined that the water would be shared equally among the upper and lower basin states. Prior to the compact, the name of the river was standardized along its length. Previously the portion of the river upstream from its confluence with the Green River had been known locally as the “Grand River”. The change was opposed by many local residents in Utah and Colorado, and the new name was enforced locally by acts of the state legislatures in both states in the early 1920s. One of the major concerns both today and back in the 1920s was the expanding population, and this increased the demand for water, particularly in California. In more recent years, mainly because of Las Vegas, Nevada has been looking for more use of the Colorado River. In 1934, Arizona, unhappy with California’s decision to dam and divert the river, called out the National Guard and even commissioned a two boat “navy.” The matter was eventually settled in court. The agreement was controversial even at the time, however. Arizona, for example, was dissatisfied with the lower basin allotment. Led by Fred Colter, the state refused to sign the agreement, and did not do so until two months after Colter’s death in 1944.:17–18 The specific allotments were disputed by Arizona until the United States Supreme Court upheld the amount in the 1963 decision in Arizona v. California. The agreement ended many years of dispute, clearing the way for the Central Arizona Project, authorized by Congress in 1968. Mexico was able to gain some of the river rights, Arizona took steps to protect its water rights and keep California from gaining too large of a share, which ultimately led to the Arizona v. California supreme Court Case. The Arizona v. California court case lasted 11 years and cost over $5 million and 50 lawyers. This case set the precedent of SCOTus using water rights. The case ultimately decided that the Boulder Canyon Provision was correct for the lower states (which are California, Nevada, and Arizona). The Court ultimately ruled in favor of Arizona, however they agreed with the way that California interpreted that it got surplus water was correct and so there was essentially some compromise on both sides. Since the development of the Colorado River Compact, California has been using the surplus water that has been left over from other states. With increasing population growth in the Southwest there is concern that this surplus soon will not exist for California’s use. In 2001, Secretary of the Interior Bruce Babbitt signed an interim agreement, determining how water surplus from the Colorado River will be allocated between the states, and creating a fifteen-year period to allow California time to put conservation methods in place to reduce the state’s water usage and dependence on Colorado River water. There is also concern regarding Nevada’s increasing population and the state’s water usage. Nevada, with the smallest water allocation in the lower river basin, may find in the near future that the water supplied by the Colorado River will not meet the state’s growing needs. In 2008 Southern Nevada Water Authority General Manager Pat Mulroy said that she does not support a water reallocation. This is because all of the states in the river basin have experienced growth she says that it is unlikely that Nevada’s allocation would increase, and it could even decrease. Instead Nevada, like California, may have to work on conservation methods as well as finding other water sources to support the state’s growing population. Development was the prime concern of the Colorado River Compact, when signed in 1922. Using and reusing the river water as well as frequent damming results in an unfavorable environment for native fish species. Dams block fish passage, reduce natural silt deposition along flood plains and in deltas, and change water temperatures—all negatively impacting the natural ecosystem. The high water usage has also caused the river delta, located in Mexico, to significantly deteriorate. Once a lush and green area from the high amounts of silt deposit, the plentiful ecosystem has now all but disappeared. The Colorado River had been over allocated since the beginning of its time, as during the signing of the Colorado River Compact, the flows were vastly overestimated and much more generous than they should have been. It was originally estimated to have 17 million acre-feet a year, but even prior to the drought flows have often been less than a third of that. In recent years,[when?] the compact has become the focus of even sharper criticism, in the wake of a protracted decrease in precipitation in the region. Specifically, the amount of water allocated was based on an expectation that the river’s average flow was 16,400,000 acre feet (20.2 km3) per year (641 m³/s). Subsequent tree ring studies, however, have concluded that the long-term average water flow of the Colorado is significantly less. Estimates have included 13,200,000 acre feet (16.3 km3) per year (516 m³/s), 13,500,000 acre feet (16.7 km3) per year (528 m3/s), and 14,300,000 acre feet (17.6 km3) per year (559 m3/s). Many analysts have concluded that when the compact was negotiated, the period used as the basis for “average” flow of the river (1905–1922) included periods of abnormally high precipitation, and that the recent drought in the region is in fact a return to historically typical patterns. The decrease in precipitation has led to widespread dropping of reservoir levels in the region, in particular at Lake Powell, created by the Glen Canyon Dam in 1963, where the exposure of long-inundated canyons has prompted calls for the reservoir to be permanently drained and decommissioned. Light shortage. When the surface elevation at Lake Mead is below 1,075 feet (328 m) relative to mean sea level but above 1,050 feet (320 m), the Lower Basin states will receive 7,167,000 acre feet (8.840 km3) per year: 4,400,000 acre feet (5.4 km3) to California, 2,480,000 acre feet (3.06 km3) to Arizona, and 287,000 acre feet (0.354 km3) to Nevada. Heavy shortage. When the surface elevation of Lake Mead is below 1,050 feet (320 m) but above 1,025 feet (312 m), 7,083,000 acre feet (8.737 km3) per year will be delivered to the Lower Basin states: 4,400,000 acre feet (5.4 km3) to California, 2,400,000 acre feet (3.0 km3) to Arizona, and 283,000 acre feet (0.349 km3) to Nevada. Extreme shortage. The most severe shortage considered in the interim guidelines is when the level of Lake Mead drops below 1,025 feet (312 m), in which event 7,000,000 acre feet (8.6 km3) per year will be delivered to the Lower Basin states: 4,000,000 acre feet (4.9 km3) to California, 2,320,000 acre feet (2.86 km3) to Arizona, and 280,000 acre feet (0.35 km3) to Nevada. On August 15, 2008, Arizona Senator John McCain called for the compact to be renegotiated. Due to the Senator’s position as the Republican Party nominee in the 2008 U.S. Presidential Election and Colorado’s swing state status, criticism of the compact may have gained national significance. Minute 319. On November 20, 2012, the International Boundary and Water Commission of the United States and Mexico signed an agreement termed “Minute 319,” which updated the Law of the River to address how the 1,500,000 acre feet (1.9 km3) of Colorado River water that Mexico receives every year would be affected by surplus or drought conditions. Under surplus conditions (when the surface elevation of Lake Mead is above 1,145 feet (349 m) relative to mean sea level) the annual flow to Mexico will increase by 40,000 acre feet (0.049 km3). In cases where the surface elevation of Lake Mead is higher than that, the extra deliveries to Mexico progressively increase, reaching a maximum of an additional 200,000 acre feet (0.25 km3) per year. Minute 319 also specifies that deliveries to Mexico will be reduced under drought conditions. Starting from the base allocation of 1,500,000 acre feet (1.9 km3) per year, annual deliveries will be reduced by 50,000 acre feet (0.062 km3) if the surface elevation of Lake Mead is between 1,075 feet (328 m) and 1,050 feet (320 m) above mean sea level; reduced by 70,000 acre feet (0.086 km3) acre-feet if the elevation is 1,050 feet (320 m) to 1,025 feet (312 m); and reduced by 125,000 acre feet (0.154 km3) if the surface elevation is below 1,025 feet (312 m). An agreement was reached by seven Western states in 2019 on a plan to manage the Colorado River amid a 19-year drought. ^ “Bureau of Reclamation: Lower Colorado Region – Law of the River”. United States Bureau of Reclamation. 2005-03-21. Retrieved 2017-01-04. ^ “Upper Colorado River Basin Compact, 1948” (PDF). United States Bureau of Reclamation. Retrieved 2017-01-04. ^ a b “Colorado River interim guidelines for Lower Basin shortages and the coordinated operations for Lake Powell and lake Mead” (PDF). U.S. Bureau of Reclamation. December 1, 2007. Retrieved 2017-01-04. ^ “Sharing Colorado River Water: History, Public Policy and the Colorado River Compact”. Wrrc.arizona.edu. Retrieved January 4, 2017. ^ “Arizona”. U.S. Bureau of Reclamation. Retrieved 2014-05-08. ^ “Central Arizona Project”. 2005-04-04. Archived from the original on 2005-04-04. Retrieved 2017-01-04. ^ “National Register of Historic Places Registration Form”. National Park Service. Retrieved January 23, 2017. ^ “Law of the River”. www.crwua.org. Retrieved 2 July 2018. ^ Hundley, Norris (2 July 1972). “Clio Nods: Arizona v. California and the Boulder Canyon Act – A Reassessment”. The Western Historical Quarterly. 3 (1): 17–51. doi:10.2307/967706. JSTOR 967706. ^ a b “The Disappearing Colorado River”. The New Yorker. Retrieved 2 July 2018. ^ Sweet, P. “Leave the Venerable Colorado River Be.” Las Vegas Sun, November 14, 2008. ^ National Research Council, Colorado River Basin Water Management, National Academies Press, Jun 1, 2007. ^ “Western States to Share Colorado River Water”. National Public Radio. 2007-12-14. Retrieved 2017-01-04. ^ “U.S. Bureau of Reclamation Final Environmental Impact Statement: Colorado River Interim guidelines for Lower Basin shortages and coordinated operations for Lake Powell and Lake Mead”. U.S. Bureau of Reclamation. October 2007. p. 15. Retrieved 2017-01-04. ^ Silver, Nate (2008-08-16). “Today’s Polls, 8/16”. FiveThirtyEight. Retrieved 2017-01-04. ^ “Interim International Cooperative Measures in the Colorado River Basin Through 2017…” (PDF). Ibwc.gov. 2012-11-20. Retrieved 2017-01-04. ^ Schwartz, John (2019-03-19). “Amid 19-Year Drought, States Sign Deal to Conserve Colorado River Water”. The New York Times. ISSN 0362-4331. Retrieved 2019-03-21. Lawrence J. MacDonnell; et al. (October 1995). “The Law of the Colorado River: Coping with Severe Sustained Drought”. Water Resources Bulletin. 31 (5): 825–836. doi:10.1111/j.1752-1688.1995.tb03404.x. Daniel Tyler. Silver Fox of the Rockies: Delphus E. Carpenter and Western Water Compacts, (Norman: University of Oklahoma Press) 2003.